On the eve of the Cuban Revolution, headstrong 18-year-old Francesca Pacelli flees from her ruthless Mafia-boss father in Havana to the arms of her lover, a rebel fighting with Fidel Castro. Her father, desperate to send her to safety in the US, resorts to torture and blackmail as he searches the island for her. So begins the first part of a spellbinding saga that spans three generations of the same family. Decades later, the family is lured back to Cuba by the promise of untold riches. But pursuing those riches brings danger as well as opportunity, and ultimately, Francesca’s family must confront the lethal consequences of their choices. From the troubled streets of Havana to the mean streets of Chicago, HAVANA LOST reveals the true cost of chasing power instead of love. 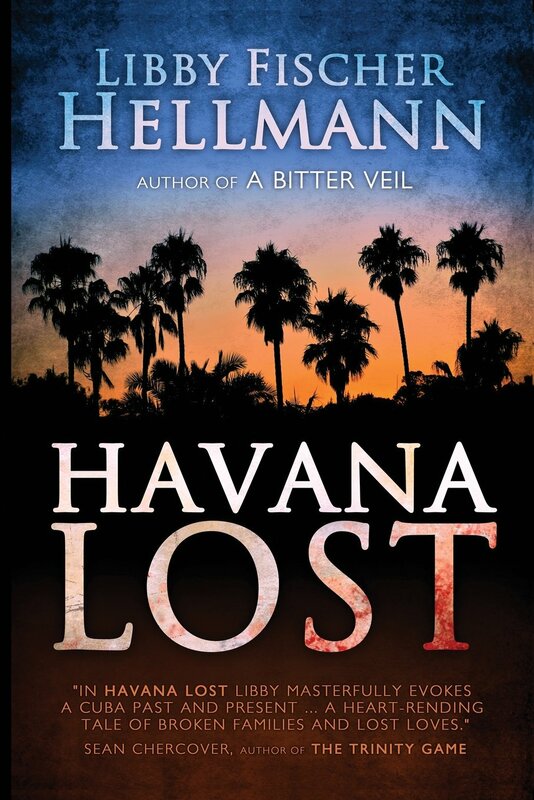 HAVANA LOST is award-winning author Libby Fischer Hellmann’s tenth novel and third thriller that explores how strife and revolution affect the human spirit. The novel is a testament to Hellmann’s gift for authentic historical detail as well as her talent for writing compulsively readable thrillers. Anthony-nominated author Libby Fischer Hellmann writes “Compulsively Readable Thrillers.” With ten novels and twenty short stories published, she has also written suspense mysteries, historicals, PI novels, amateur sleuth, police procedurals, and even a cozy. At the core of all her stories, however, is always a crime or the possibility of one. A recovering news junkie, Libby is a transplant from Washington, D.C., where, she says, “When you’re sitting around the dinner table gossiping about the neighbors, you’re talking politics.” Armed with a Masters Degree in Film Production from New York University, and a BA in history from the University of Pennsylvania, she started her career in broadcast news. She began as an assistant film editor at NBC News in New York, but moved back to DC where she worked with Robin MacNeil and Jim Lehrer at N-PACT, the public affairs production arm of PBS. When Watergate broke, she was re-trained as an assistant director and helped produce PBS’s night-time broadcasts of the hearings. In 1978, Libby moved to Chicago to work at Burson-Marsteller, the large public relations firm, staying until 1985 when she founded Fischer Hellmann Communications. Currently, when not writing, she conducts speaker training programs in platform speaking, presentation skills, media training, and crisis communications. Additionally, Libby also writes and produces videos. A few years later, Libby introduced her second series featuring hard-boiled Chicago PI Georgia Davis, which Chicago Tribune describes as, “a new no-nonsense detective …. tough and smart enough to give even the legendary V.I. Warshawski a run for her money.” There are three books in that series so far: EASY INNOCENCE (2008) and DOUBLEBACK (2009), which was selected as a Great Lakes Booksellers’ Association “2009 Great Read,” and TOXICITY (2011), a police procedural ebook thriller that became the prequel to the Georgia Davis series. SET THE NIGHT ON FIRE, (December, 2010) is a standalone thriller that goes back, in part, to the late Sixties in Chicago. Publishers Weekly describes it as “top-rate” and says, “A jazzy fusion of past and present, Hellman’s insightful, politically charged whodunit explores a fascinating period in American history.” It was short-listed for ForeWord Magazine’s Book of 2010 in the suspense/thriller category. Her most recent stand-alone, A BITTER VEIL, which PW calls “meticulously researched and fast-paced”, was released in April, 2012. It’s set in revolutionary Iran during the shah’s overthrow and rise of the Islamic Republic. And her latest thriller, HAVANA LOST, spans tree generations of the same family and is set largely in Cuba. Libby has also edited a highly acclaimed crime fiction anthology, CHICAGO BLUES (October, 2007). In May, 2010, she published a collection of her own short stories called NICE GIRL DOES NOIR. In 2005-2006 she was the National President of Sisters in Crime, a 3,400 plus member organization committed to strengthening the voice of female mystery writers.